What’s the Real ROI on Virtualisation? While server virtualisation may be proving very popular, it’s not yet achieved what we might call ‘mainstream status’. Currently, it is being targeted at non-critical workloads such as development and test, or other ‘low hanging fruit’ in terms of consolidation targets. In both of these scenarios, the business case is relatively straightforward to articulate. But if, and when, virtualisation becomes more of a business-critical element of infrastructure, then it’s going to have to up its game. While initial business cases, for discrete workloads might be simpler, is there a premise for virtualising an entire data centre? Where’s the value to be had, particularly when the operational costs start to escalate, and the benefits become more dependent on making the most of the resulting environment? And indeed, if virtualization moves from being a small scale event to requiring a change programme to deploy, how can any organization be sure the benefits will be realized? 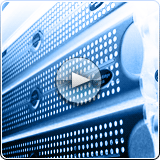 This webcast takes a cold, hard-nosed look at server virtualisation. Based on the real-world evidence gathered during Reg workshops, we clarify and quantify exactly what are the benefits of server virtualization on a production scale, and we ask how exactly such benefits can be achieved. Most importantly perhaps, we review what pieces of the virtualisation puzzle become fundamental, and what are optional when it comes to up-scaling virtualisation. If you’re interested in knowing what’s to come beyond the straightforward consolidation of simple workloads, then this webcast is for you.